Navigating delayed flights to snaking long queues at immigration counters are just a few of the problems that the average traveller may often face while at an airport. Frustrating as these may be, one man’s plight overshadows them all. Stuck in an airport for a measly 6 hours? Scratch that. Now, imagine being stuck at the airport for 8 months. While the idea of being confined in the airport might sound ludicrous at first, Hass an Al Kontar is all too familiar with this particular predicament. 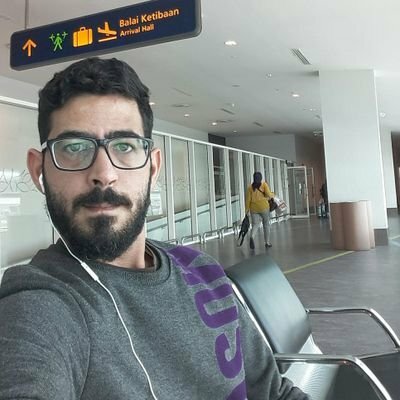 A 36-year-old Syrian refugee, Kontar spent the last 8 months in limbo, stuck in Kuala Lumpur International Airport in Malaysia. He had been living inside KLIA’s domestic transfer lounge since March, remaining stuck in Malaysia after a number of failed attempts to leave the country. Low on funds and almost completely dependent upon the generosity of strangers for basic essentials, Kontar seemed to be always running out of options. Hassan first arrived in Malaysia in October of 2017, after being deported from the United Arab Emirates, where he had lived for the past 11 years. Originally from Syria, Kontar moved to the UAE for work and in search of a better life. However, when the Syrian Civil War broke out in 2011, Kontar was summoned back by his country to fight. He objected and refused to return. “I refused not because I am a coward but because I don’t believe in war,” he told Newsweek. “It’s not the solution, it’s not the answer. I don’t want to kill my own people and it is not my war.” When his visa eventually expired in 2012, the Syrian embassy in the UAE refused to renew it, consequently causing his work permit to be made invalid. Because of this, Kontar lost his job as an insurance marketing manager. Remaining in the UAE for the next 6 years, Hassan lived and worked illegally to survive. In 2017, authorities in the UAE apprehended Kontar and deported him to Malaysia, one of the few countries that allows Syrians to enter the country without a visa for up to 3 months. Kontar then attempted to get a visa to permanently live there but failed, prompting him to attempt to leave and try his luck with another country that was willing to accept Syrians without a visa, Ecuador. However, he was repeatedly denied permission to leave the country on a number of different occasions, prompting him to state: “It’s impossible to get a visa anywhere. This is our life as a Syrian. It’s a tragedy.” In a last-ditch attempt, Kontar attempted to travel to Cambodia in March 2018 but was refused entry into Cambodia by the authorities at Phnom Penh Airport. He was then sent back to Malaysia, where he has remained ever since. For a few months, Kontar lived under a stairwell in KLIA’s Terminal 2 transit zone. He slept on a mattress on the floor and survived on the generosity of others, with his funds dwindling slowly as the days passed. Helpful and friendly airport staff members would often bring him pre-packaged airplane meals and once in a while, would assist him with washing his clothes. Hassan spent a good chunk of his time online, with the Internet being the main way that allowed him to remain connected with the outside world. It allowed him to speak with friends and family, update various organizations and online communities set up to support him on his current status, and even post to social media. Through a variety of platforms such as Twitter and Snapchat, Kontar was able to reach a global audience of individuals who were wanted to help resolve his precarious situation. In the first week of October 2018, Kontar was arrested by Malaysian Authorities. Human rights groups are now worried that Kontar might now be forcibly deported back to Syria. According to The Star, a Malaysian news outlet, Immigration director-general Da­­tuk Seri Mustafar Ali said that Kontar was arrested for being in a restricted zone of the Airport. “Flight passengers with boarding passes at the boarding area are supposed to get on their flight, but this man did not do so. As he was in a restricted zone, the authorities had to take necessary action,” said Mustafar in a press conference. As of now, the biggest concern is Kontar’s safety, well-being, and whether or not he will be forcibly deported from Malaysia. While Kontar’s situation seems dire, a number of organizations and human rights groups are working on his case. The UN refugee agency released a statement that detailed how they were working alongside Malaysian Authorities to “get a better understanding of the circumstances.” In addition, Amnesty International released a statement calling for Kontar to be given protections under international law. He has other options on the table as well, such as potentially being able to receive asylum status in Canada, where a human rights group has raised over 17,000 dollars to sponsor his asylum application. However, this application is still being processed. Interestingly, this is not the first time such an incident has occured. In 1988, a man named Sir Alfred entered Charles de Gaulle Airport in France, and was unable to leave for the next 18 years. In this case, he was unable to leave due to passport and citizenship issues. A 2004 Tom Hanks movie called The Terminal was inspired by this particular incident. Today, many have drawn similarities between Kontar’s plight and the plot of the movie. While it remains to be seen how this situation will resolve itself, it remains clear that many around the world are looking to see what the Malaysian authorities’ next step will be.